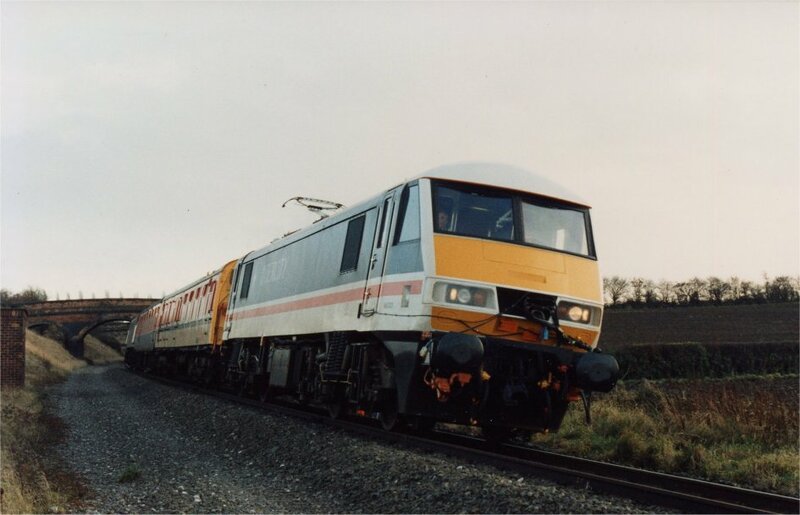 During the 1980's several front line 25kV AC electric locomotives were taken to Old Dalby in order to evaluate the aerodynamic performance of their BR/Brecknell Willis pantographs away from live overhead line. This picture of the BR/Brecknell,Willis Highspeed pantograph shows the aerofoils, which were attached either side of the top frame in order to increase the uplift force in one direction. These could be adjusted to suit the type of traction unit on which the pantograph was operating. Note also the tabs at the extreme ends of the horns. Aerodynamic tuning was achieved in the following way. The pantograph was raised in the normal manner but restrained by the use of two cables between each carbon carrier on the head of the pan and the base frame. Attached in-line with these cables were load cells, which allowed the uplift in each carrier to be measured. When the locomotive was propelled at speed any increase in uplift force due to the aerodynamic effect could be measured. By careful design of the individual items which made up the pantograph head and frame these effects could be countered or minimised. In the UK, excessive uplift force can lift the contact wire and in extreme cases the pantograph head can come into contact with the registration arms resulting in damage to both the pantograph and the OHLE and in a possible dewirement. 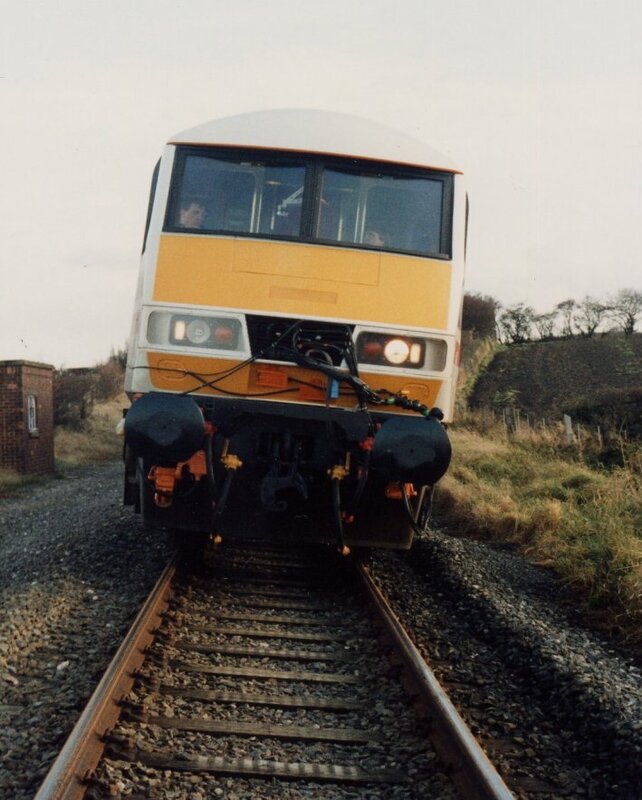 Tests of this nature were usually conducted off the wire but tests with APT-P in Scotland in 1983 used the same principle beneath live OHLE, with a second power car providing propulsion! 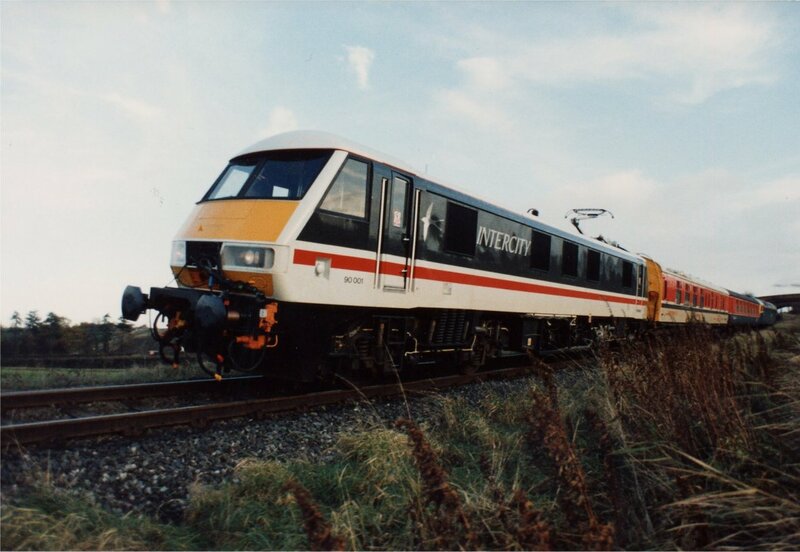 At Old Dalby the aerodynamic tests were carried out by propelling the electric locomotive and test car with a diesel locomotive at speeds up to 100 mile/h. Propelling meant that no other influences affected the aerodynamic performance of the pantograph. 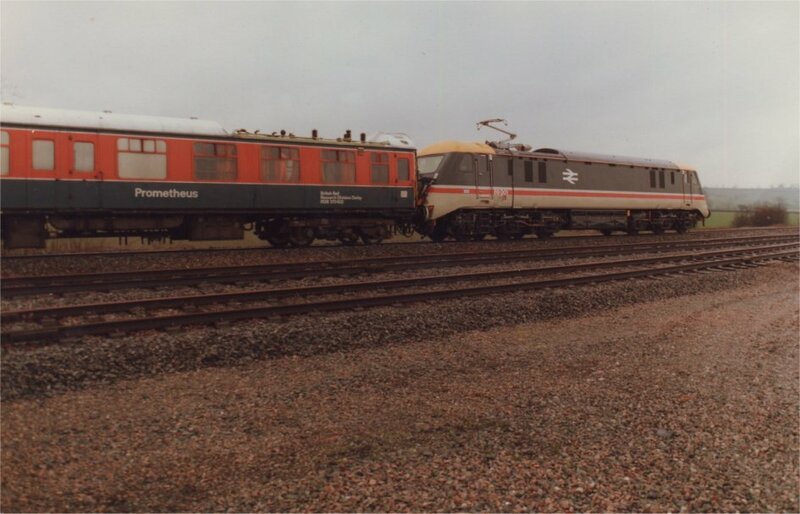 Even having a diesel locomotive in front of the electric loco could affect the air flow over the roof and hence the pantograph performance. The BR/BW pantograph could be fine-tuned by adjusting the angle of the aerofoils or in extreme cases by replacing the carbon carriers by a more sympathetic cross-section profile shape suited to the particular locomotive. These test were only conducted over the section of the line where the 'dead' overhead equipment was situated. hence the train would set off from the Control centre with the pan down and when was under the wires the pan would be raised. Following the test run of around two miles, the pan would be lowered before Stanton Tunnel. Failure to do this would most likely have resulted in the pan striking the tunnel roof. 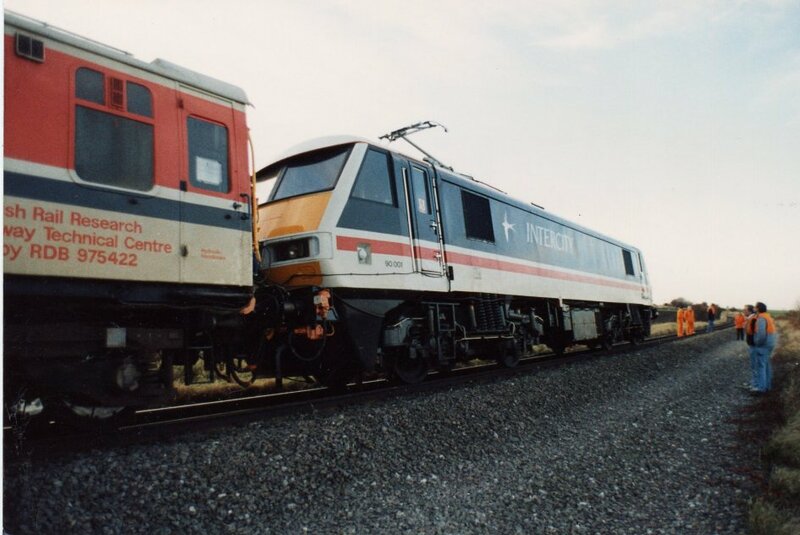 Here are a few photos of the class 89 and class 90 locos undergoing pantograph aerodynamic tuning. 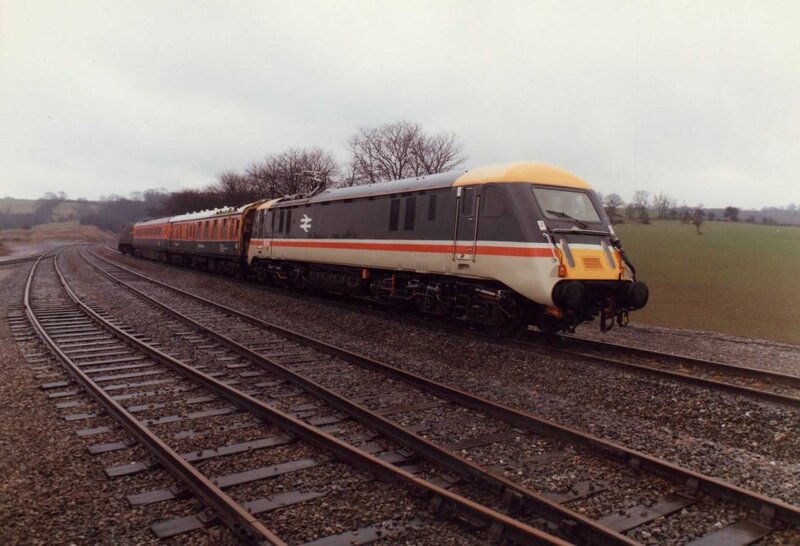 91001 underwent similar tests in 1988. Click on the picture for a bigger image all photos courtesy Derek Young except where indicated. 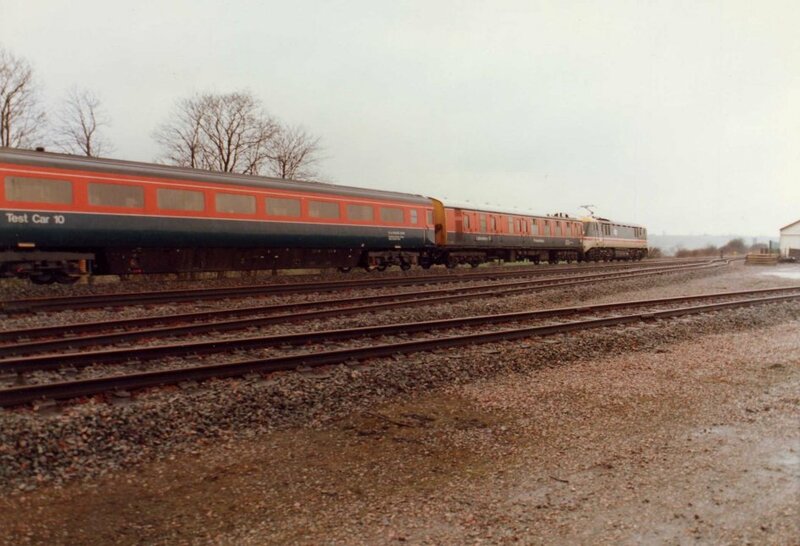 In April 1987, 89001 stands just to the north of Grimston Tunnel coupled to 'Prometheus', the high speed pantograph testing vehicle, then owned and operated by the Research Division of BR, a make-up coach and a class 47 locomotive at the rear. This view shows the pantograph in the raised position, restrained by two cables for instrumentation calibration purposes. The train will soon be setting off north for a run down the Widmerpool straight, where the pan would be raised for the tests, propelled by the class 47. 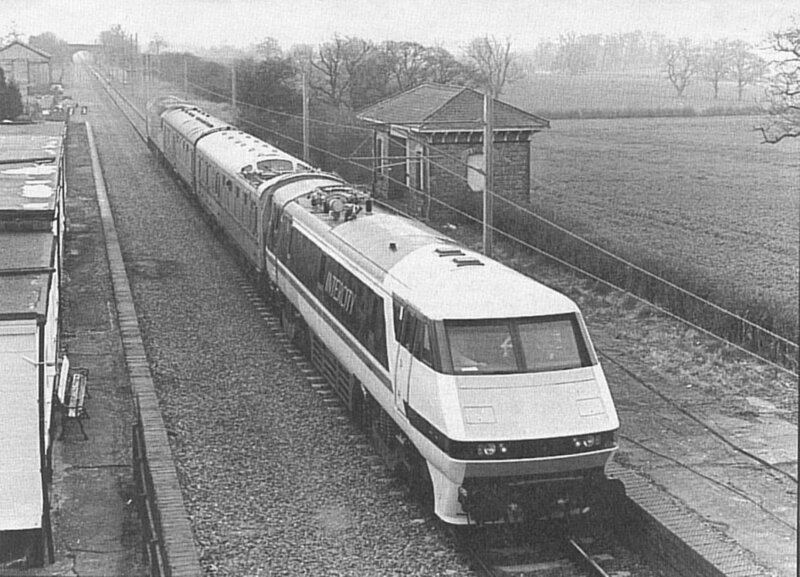 Probably in late 1987 or early 1988, 90001 stand on the Plumtree curves following a high speed dash down the straight, with a class 47 propelling the train. The pan is probably raised for instrumentation calibration purposes as the loco would never have got through the bridge in the background with the pan up. This shot shows the train, probably consisting of 'Prometheus' and TC10 again with a class 47 at the rear. A camera was mounted inside the cab of the class 90 and the picture transmitted to the driver of the class 47. This head-on view shows the camera bracket just to the left of the central windscreen pillar. 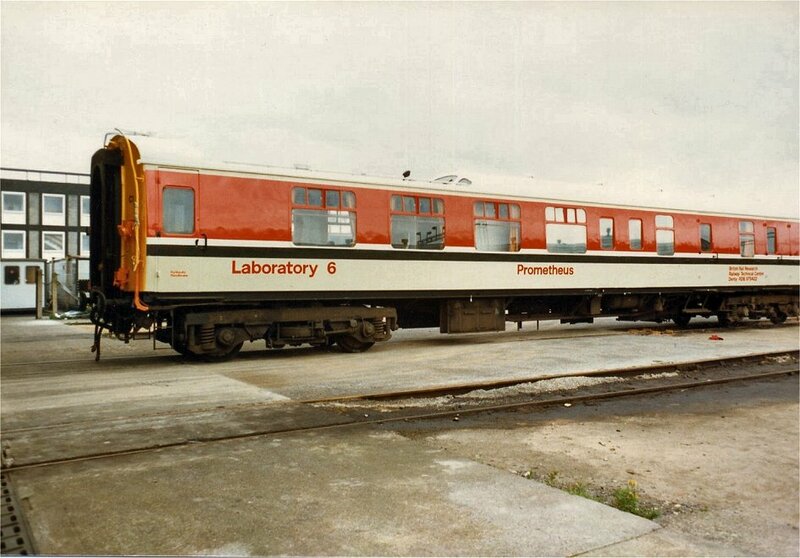 The cabling was in connection with the locos acceptance testing and would normally have been connected up to a Test Car. It was temporarily tied back out of the way for these tests. More pictures will be added if they come to light!